There is so much culture and religion in Bali it would take a lifetime to truly understand it all, and another lifetime to document it. In the Bali pages of this site can be found some of the fascinating aspects of Balinese, religion, life, and culture. There is a legend told of an island east of Java. It was a beautiful island but its fertile plains and palm-fringed shores rocked and were unsteady. The Gods conferred. They decided that the answer lay in placing a mountain upon the island to balance calm and sooth it. And so they did. Happiness then reigned on the island and all was at peace. The Mountain was called Great Mountain Gunung Agung and the island was Bali – the morning of the world, set amid the thousands of islands that are Indonesia. In Bali, Hindu Dharma, also called Agama Hindu, is the name of the religion followed by 95% of the 2.8 million population of the Island. The remaining 5% practice a mixture of faiths: Islam, Catholic, Protestant, Buddhism, and Kong Hu Cu. The practice of Agama Hinduism is a devote religion that had been developed from a mixture of native Island practices and Hinduism brought to the Islands by Indian traders over 1200 years ago. Agama Hinduism is similar to the Hinduism practiced in India but different and very unique. The Balinese adhere to religious principles and practices that govern their, birth, life, passage (reincarnation), and family life, with great reverence. This reverence can be seen in their dedication to keep their, Art, Dances, Music, and Customs alive and part of everyday life. 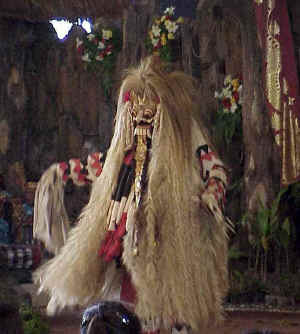 Tattwa (Philosophy), Susila (Etiquette), and Upacara (ritual). As each lifetime is regarded as a passage from one stage to another, so also there are critical stages during life where an important passage occurs leading toward adulthood. Cremation of the dead (pengabenan pelebon) and the ceremony pitra yadna is perhaps the most important and often the most colorful ritual in Balinese religion. A quick glance at the various basic architectural elements in Bali reveals a lot about the lifestyle of the Balinese. Balinese people live under two bonds. The first is determined by descent and caste. The second is determined democratically by his village and Banjar organization.